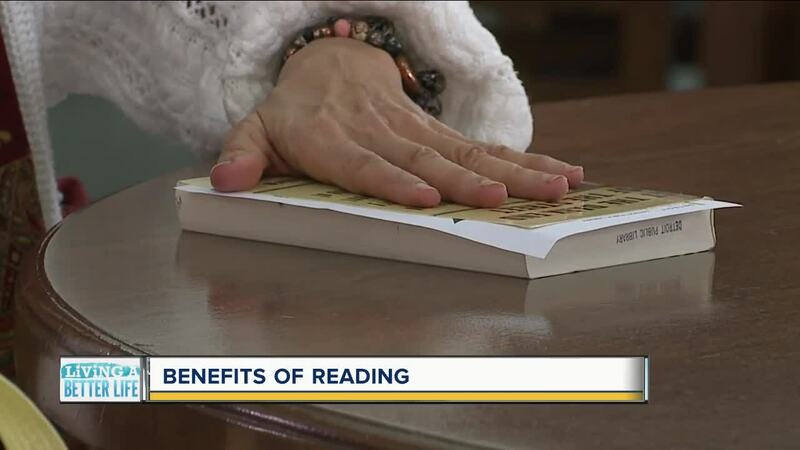 It's a good time to underscore the benefits of reading at any age. As we continue to celebrate National Reading Month in March, it’s a good time to underscore the mental and physical benefits of reading at any age – and try out some new strategies to make you a better reader! When we dropped in at New Order Coffee Roasters in Detroit, we found plenty of readers. We started polling them about which books they liked to read more – fiction or non-fiction? “I would say fiction more,” said manager Nathan Glitman who always carries a book in his backpack. “Non-fiction all the way,” Carlene Fowlkes declared with a smile. “Mostly fiction, science fiction fantasy,” said Mike Smith – though he admits his 2-year-old often distracts him from his reading endeavors. Over at the Detroit Public Library’ s Duffield Branch, we found some die-hard book clubbers. “I belong to 3 different book clubs,” Mary Lucas explained. And the more you read, the better! Branch Manager Maria Bryson – who has a Master’s degree in Library Science – said one of the main health benefits of reading is that it relieves stress. “That allows your body to start relaxing. Your heart rate can go down. And it just makes you feel better,” said Bryson. Also, reading strengthens your brain by making new connections. “It’s kind of like exercising your brain. All the pathways are getting stronger. And it’s helping you become a better critical thinker,” Bryson explained. That can help preserve brain health and lower the risk of Alzheimer’s disease. And that bookworm survival advantage lengthens your life. A Yale University School of Public Health study found people who read 3.5 hours a week or more (i.e. 30 minutes or more a day) lived an average of two years longer than those who didn’t read at all. The long-term study of 3,635 people who were 50 years old or older was published in the September 2016 issue of the journal Social Science & Medicine. Reading has also been found beneficial in other ways -- from helping people fall asleep to boosting overall happiness and life satisfaction. Many of us want to read more, but we often find it hard to find the time. So, Bryson has a few suggestions. Pick something you’re interested in reading or re-reading -- like a classic novel you loved in high school. Pick a dedicated reading time. Setting a reminder on your smartphone can help you form a habit. Keep a list of the books you read. That will give you a sense of accomplishment. You can keep the list posted on your refrigerator or write it down in a journal. It’s fun to see the number of books grow…along with the variety! If you haven’t ever been in a book club, consider joining one. Book club groups often expose you to books you otherwise wouldn’t have read.